Oh hi everybody! Lookit! 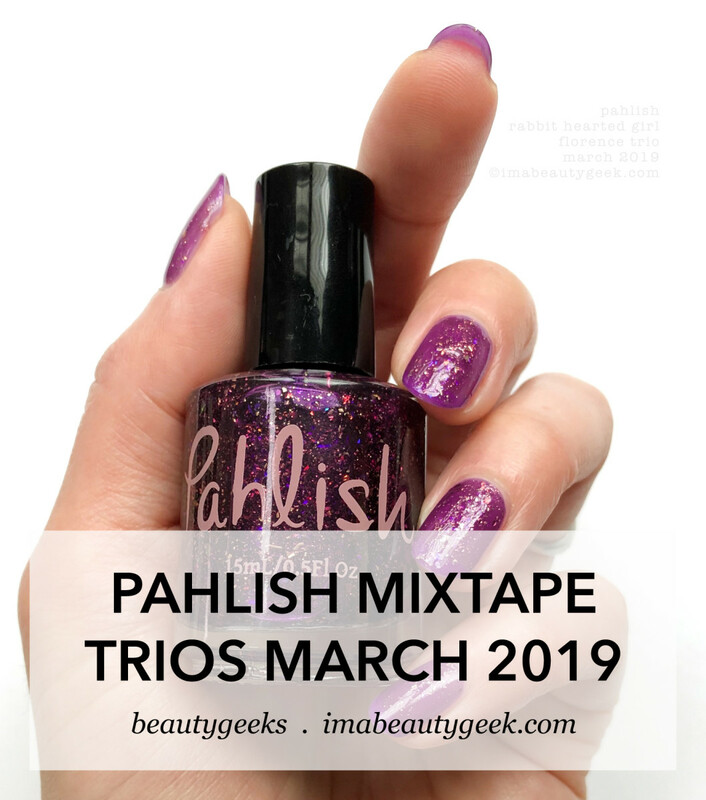 It’s me and the March 2019 Pahlish Mixtape Trios! What does that even mean? Well, this month, Shannon has made two separate trios inspired by the two albums she can’t stop playing on repeat. Let’s look! 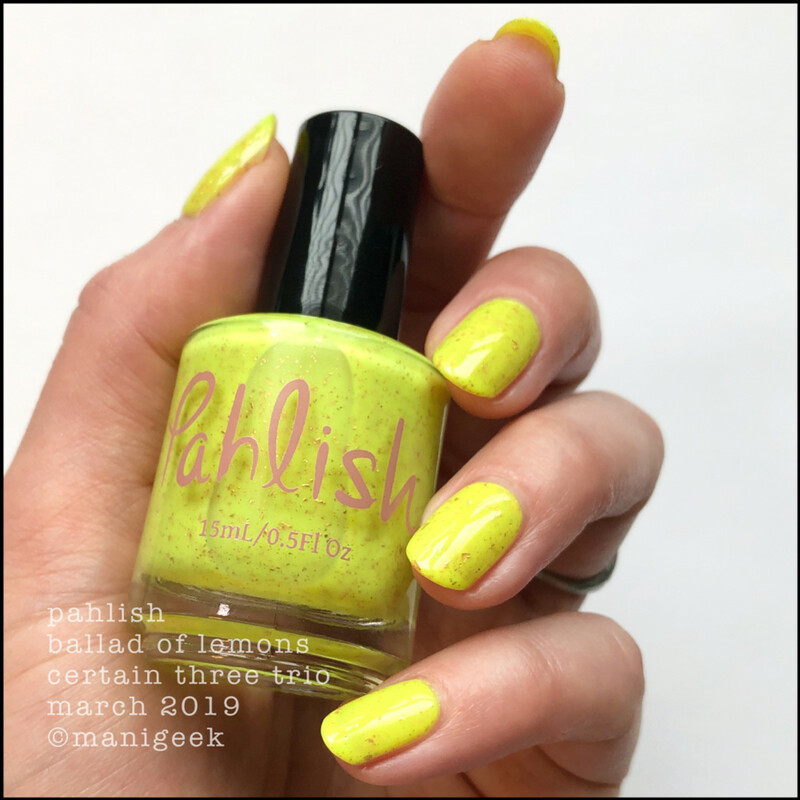 Pahlish Ballad of Lemons – Certain Three Trio (above). I took notes! They say that this was 3 coats. What they don’t say is that this is a beauty of a punch-in-the-eye creamy kind of neon that has a whack of coppery/golden flakes jammed in it. Pahlish Melody – Certain Three Trio (above). Wheee!! So pretty! I love that Shannon is all over these gold flakes. There’s an elegance about about them; when stuffed into a 3-coat coral neon, they take an in-your-face shade and make it somehow delicate. Weird, right? 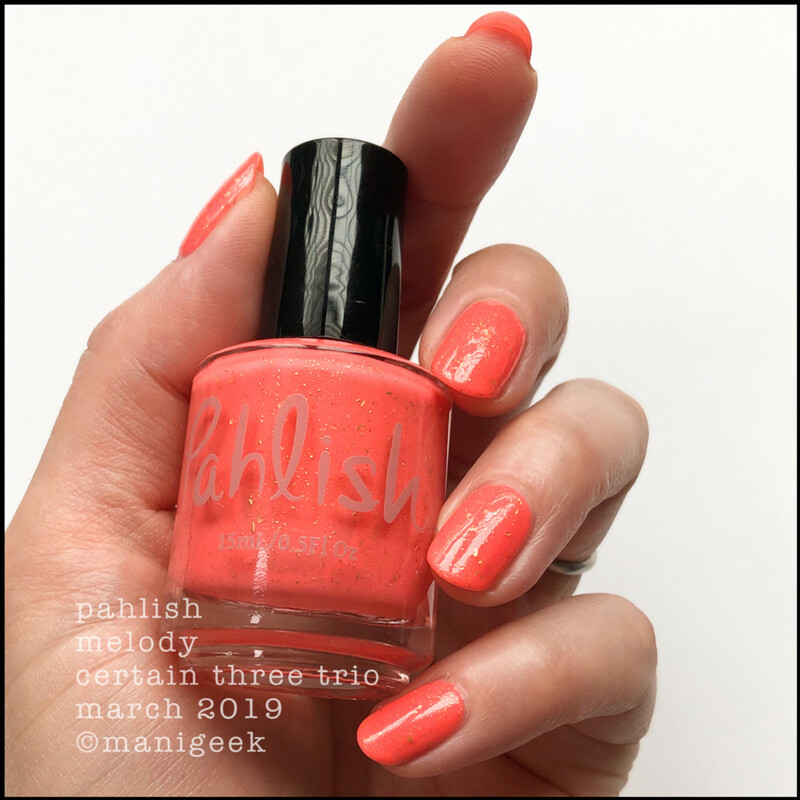 Pahlish Jun – Certain Three Trio (above). This one isn’t a neon, but in 2 coats it’s actually just a touch dusty. Mixed up with that perfect amount of gold flake, it just makes me swoon. Oh. Do you need to know that trio is based on “Melody of Certain Damaged Lemons” by Blonde Redheads? Because it is. Pahlish Dog Days – Florence Trio (above). Greeeeeeen!!! That’s 3 coats and there are so many fabulous flake things in there that I did crazy-thin coats and kind of tried to smash as many flakes as I could down onto the nail. With top coat, the result is this thing with so much under-glow I can barely stand it. If you dig green polish, you should think about this one. Yep. 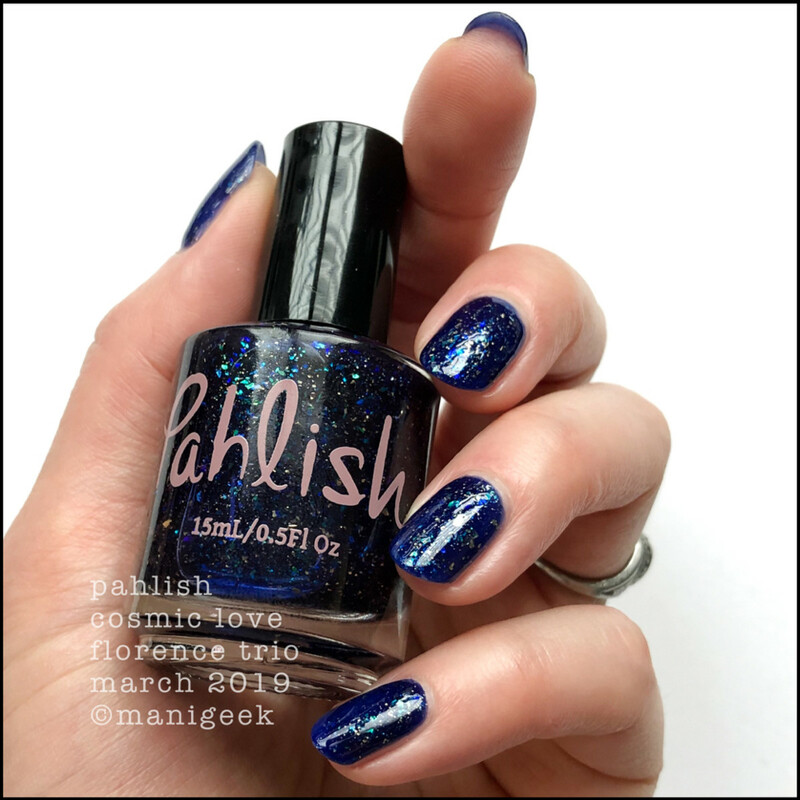 Pahlish Cosmic Love – Florence Trio (above). How many coats? 3 + top. I didn’t do as much active laying down of flakes on this one. but I don’t think it mattered. Lookit my zero-effort galaxy nails! 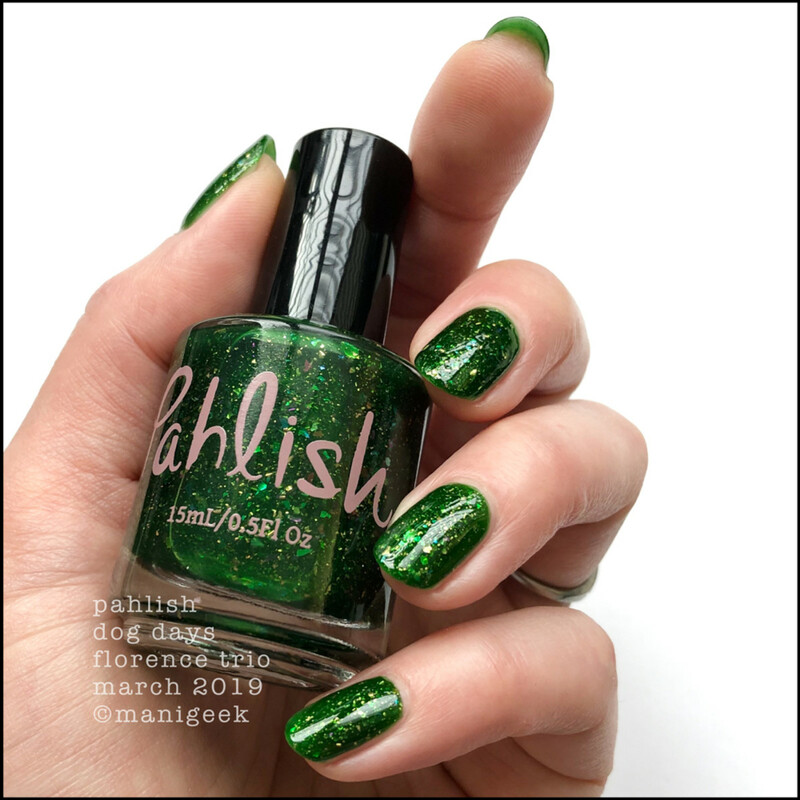 Pahlish Rabbit Hearted Girl – Florence Trio (above). My notes just say 3 + top and then there are like a billion hearts. I’m pretty sure that means I love this very much a lot a lot a lot. Oh! And if you’re wondering about the difference between this photo and the one on the landing page, this is 3 coats + top, and that other one is 2 no top. Inspiration? Well that was "Lungs" by Florence & the Machine. And that’s it! 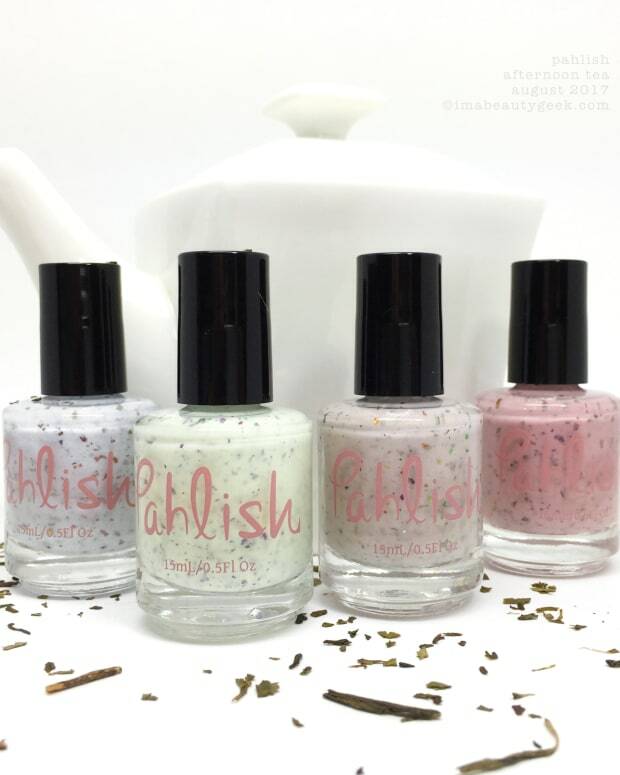 That’s the March 2019 Pahlish releases! Both trios are available right now and they should be around for at least 30 days. Me? I’m still wearing Rabbit Hearted Girl – it’s probably the only crelly I’ve ever loved this hard. manicures & photos karen falcon (she’s gonna cook rice tonight – she doesn’t even really like rice).